COMMENTS: Easy to use. Not sure why I had not ordered these sooner. Makes pouring lip balms MUCH easier. COMMENTS: I love how well the lip balm tubes fit in the slots, it makes filling the tubes easy and less messy. The only thing that I had an issue with is cleaning, the silicone can be a little more difficult to clean than the plastic. But definitely works well and made lip balms less of a hassle! "Oval silicone lip tube filling tray 3002"
COMMENTS: finally ordered this - certainly wish we'd had it sooner - will order more soon - makes pouring balms/perfumes so much easier - a must have! thanks! "Best Filling Tray!! It's silicone!" COMMENTS: We have had issues with every round filling tray (from multiple suppliers) not working uniformly. Tubes wouldn't fit right and if you forced them the lids wouldn't fit right after they would be loose. We finally decided to try the oval tubes in hopes that the tray would be better. This tray is silicone and every tube fit without forcing and they weren't loose in the tray either. So happy we FINALLY made the switch, wish we had done this a long time ago. For the small price difference between round and oval, it's totally worth it in our opinion. COMMENTS: The tubes do not fit all the way to the top in this holder there by leaving my lip balms with muffin tops that look like someone already cranked them up alittle. not appealing to think someone already used your new lip balm. I tried to be more careful to not fill them too full but that's hard..
"Does not stand on its own "
COMMENTS: The day I ordered this, I was not paying full attention and bought the oval instead of the round. I ended up changing the shape of my lip balms. So I ordered the oval tubes and tried it out. Works great and it helps me change the look, which I wanted to do this year, to freshen up the brand. "A must for filling the lip balm tubes!" COMMENTS: This filling tray makes it so much easier to fill your lip balms. Easy peasy! COMMENTS: Love both of the silicone filling trays! COMMENTS: Made filling lip balm tubes a breeze. COMMENTS: I love this product allows me to make a bunch of lip balms at once and they do not fall over in the process! "Works okay. Hard plastic trays work better. " COMMENTS: Pros: The flexible silicone tray fits oval lip balm containers from a couple different container companies. Its flexible shape allows for some slight variances in container shape to still fit in the openings. That said, its flexibility is also it's downside. Cons: Unlike hard filling trays I have, this entire tray flexes if you move it at all. More than once I've needed to move this tray after I filled it—but in doing so every lip balm tube falls out. COMMENTS: I loved using this tray. It was super easy to use. The only thing I didn't care for is it's a little bit wobbly being silicone. However, if you load the entire tray with tubes, then it's much more steady. Very easy to clean. Easy to clean up spills. COMMENTS: Very handy in filling a lot of tubes at one time. COMMENTS: This is a great Tray, easy to use and easy to clean, I have two of them and they are the best. Good quality. COMMENTS: If you make, or are thinking of making lip balm, you have to have this. COMMENTS: This tray made making lip balms super easy. It allowed the lip balm to be poured easily and all the tubes to look uniform and professional. COMMENTS: I will definitely buy another one of these. Its a great idea and makes filling tubes much easier. COMMENTS: Great tray to fill oval shaped lip tubes, makes pouring (spilling) a lot easier to clean up! COMMENTS: I love these silicone lip balm trays. They make it super easy to hold the lip tubes and get them out. "What size tube do these hold? I have 1/2 oz Stick Flat Tube with Cap,Dimensions: 1.5" width by 3" height will this or another product you have work?" Staff Answer This tray was designed to fit our oval lip tubes. 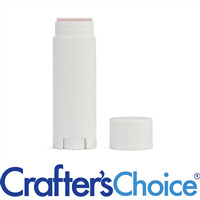 Here are links to these products: http://www.wholesalesuppliesplus.com/products/0.15-oz-lip-tube-cap-natural-oval.aspx and http://www.wholesalesuppliesplus.com/products/0.15-oz-lip-tube-cap-white-oval.aspx. "Does this tray leave the extra lip of lip balm over the top of the actual tube? All oval trays i have tried leave at least 1/8 inch of excess over the rim of the tube. Looking for one that pours flush." YES, it does! I'm very disappointed. I already have three filling trays from another supplier which leave that extra bit on top. Based on the staff response to your question I bought this filling tray and it also has the extra space on top! So frustrating! Why do they make them that way?? Staff Answer I am sorry that you were not satisfied with our filling tray. 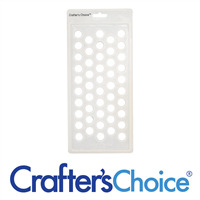 The lip tube filling trays are designed to create minimal over pour. This over pour eliminates sink holes which are a common issue in lip balms. "What is the best way to pour into these trays so that you do not get an indention or an overfill? Thanks." The tray is for overfill to make it easier you can use something with a pour spout like the ones they sell on the web site. "how long do these have to set before u can remove them from the tray. Tracy"
It depends on how fast your recipe hardens. I would say at lest an hour, you do want your product to be hard at the time of removal. "How many tubes fit into this filling tray?" It will hold 48 tubes at a time. "Hi, Which lip tube and cap works with this tray?" Staff Answer Our 0.15 oz Lip Tube & Cap - Natural, Oval and our 0.15 Lip Tube and Cap - White, Oval work great with this product.